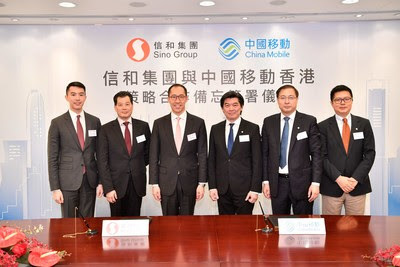 Sino Group and China Mobile Hong Kong Limited (CMHK) today signed a strategic memorandum of understanding to develop a pre-5G infrastructure across Sino Group’s residential and commercial properties, using CMHK’s Narrowband Internet of Things (NB-IoT) technology. This partnership, initially encompassing Smart Home, Smart Shopping Mall, and Smart Property Management, supports Hong Kong’s transformation into a “smart city” and allows its citizens to enjoy a better quality of life. According to Daryl Ng, JP, Deputy Chairman of Sino Group, the strategic partnership with CMHK will not only provide greater convenience and quality experience to Sino Group’s customers, it also supports Mainland China and Hong Kong’s vision to accelerate societal development through the use of technology. “As many countries have already established their innovation and technology development blueprints, Hong Kong must accelerate its pace of technological development in order to maintain its competitiveness. Sino Group will do our part to implement various technological solutions across our properties in support of Hong Kong’s move into a smart city,” continued Mr Ng. Under the partnership with CMHK, IoT and big data technologies will be applied to enhance the experience of Sino Group’s commercial tenants, enhance its property management efficiency and facilitate environmental protection. “The 5G evolution is crucial to shaping Hong Kong into a smart city, and CMHK is imperative to proactively develop 5G mobile service applications towards advancing the development of Hong Kong’s 5G mobile communication network. With plans to upgrade our existing base station equipment, we are well poised for the arrival of 5G and the future Internet of Things. We are extremely excited about our partnership with Sino Group to further its property network coverage, and support its future development,” added Mr Lee. In March this year, CMHK became the first mobile operator to successfully obtain the “Trial Permit for 5G Test” from the Office of Communications Authority (OFCA). The company will commence the lab tests with 5G commercial equipment at the assigned 5G trial spectrum in the second quarter.